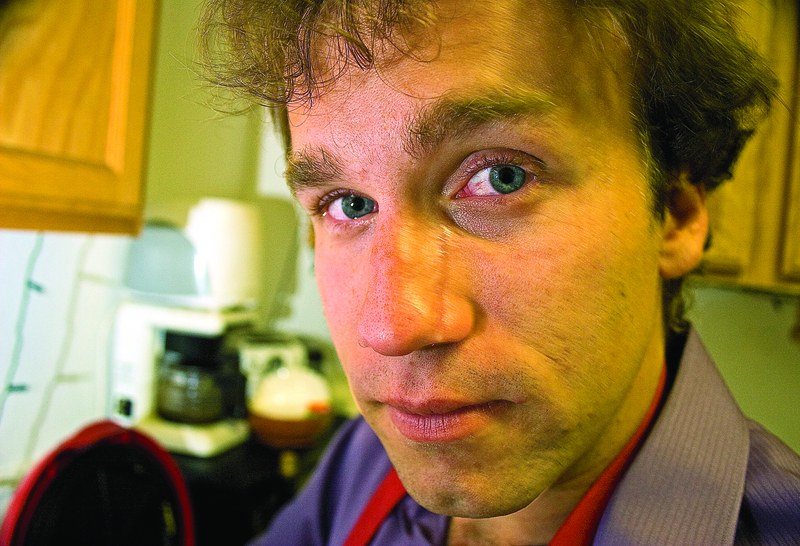 Most of the time, I do not eat it fast enough and it begins to ferment. Not go bad, per se, but you can tell it’s fermenting after 10 days or so, despite all the lemon and lime juice in it. This is also a great recipe if you want to take the first step toward cooking your own beans, instead of buying them in the can. It’s forgiving, it’s delicious and no one will know they’re eating beans. I’ve included instructions for both electric pressure cooker users (such as the InstantPot) as well as those using a slow cooker. You could also cook the beans on the stove, but I prefer one of the two plug in methods. Because hummus is so simple, and its basic ingredients are so few, it is a type of blank slate dish that can take on any number of additional flavors. My favorites are roasted green chiles (a New Mexico favorite) and marinated artichoke hearts. Take a look at the commercial hummus being sold in your local store: there’s pimento hummus, there’s hummus with dill, there’s hummus with ingredients it shouldn’t be paired with. 1. 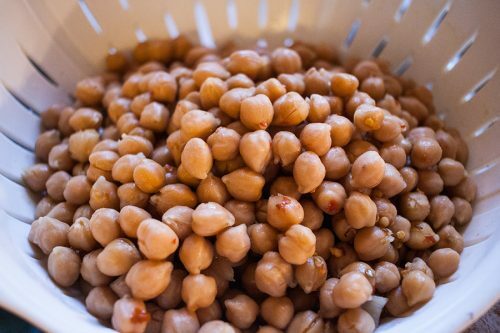 Soak the chickpeas overnight in cold water at a rate of three times the quantity of water to chickpeas. 2A. If cooking the chickpeas in a slow cooker, cook on low for 5 to 8 hours. Make sure the chickpeas are covered with water. 2B. If cooking the chickpeas in an electric pressure cooker, cover with 3-4 inches of water and set for 15-20 minutes, or 20-25 minutes on beans. 3. 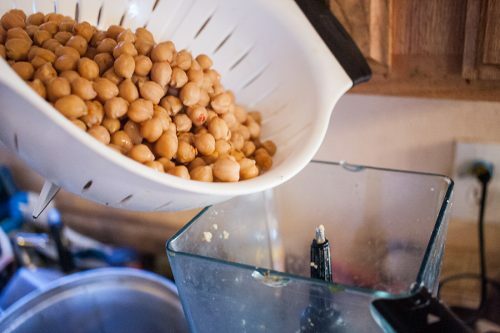 Drain the chickpeas, reserving 1⁄3 cup of the cooking water. 4. 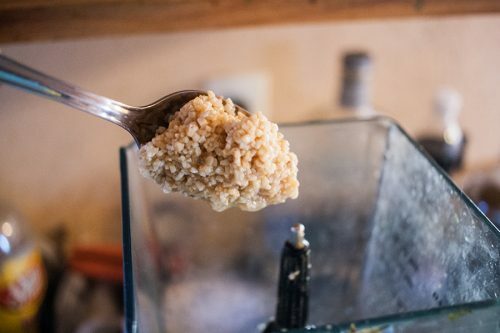 Add 2⁄3 of the chickpeas (or all, to make a creamier hummus) into a blender or food processor, along with the lemon juice. When blending, a little more liquid can help facilitate the process. Add a few tablespoons of cooking water as needed. 5. Add the tahini and continue blend until everything is mixed. 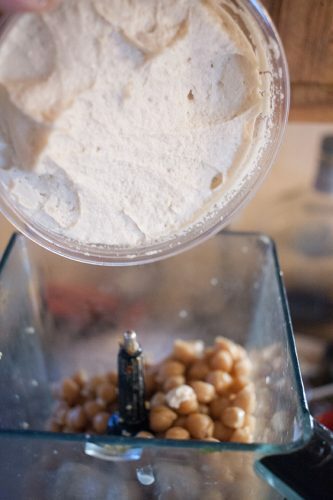 Once the chickpeas blend with the tahini, the color should change to a lighter shade of yellow. 6. 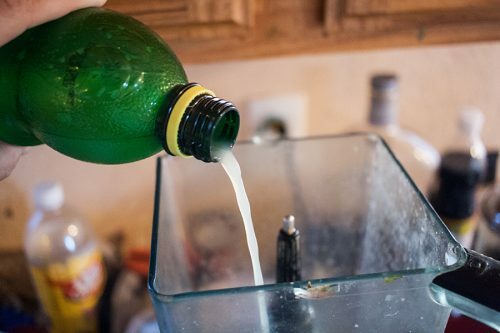 Decant the mixture into a mixing bowl and add into the blender the garlic, the lime juice, the olive oil and, if using, the artichoke hearts or other ingredients and blend. Add the new mixture into the mixing bowl and stir until well combined. 7. Add salt, or garlic salt, to taste. Start with two teaspoons. Just enough salt will make the flavors of the hummus pop. 8. Add the rest of the chickpeas, either only briefly blended or whole, depending on texture desires. 9. Refrigerate or enjoy immediately, The hummus will get just a little bit better and thicken after it has been refrigerated. See just the recipe here. See the full album of photos on Flickr. The cooked chickpeas (garbanzo beans) after they have been strained. The flecks of red are from red chiles they cooked with. Lemon juice helps the blending process and adds a necessary acidity. I add garlic (chopped) to the blender before adding the garbanzo beans. 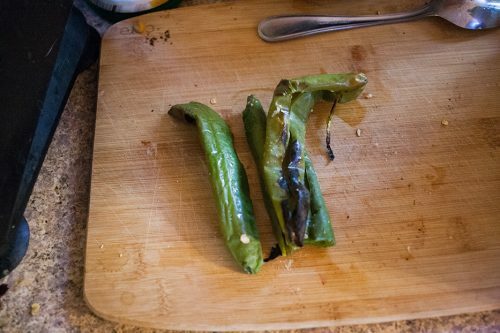 Roasted green chiles, before they are diced and thrown into the blender. They were roasted on the barbecue. 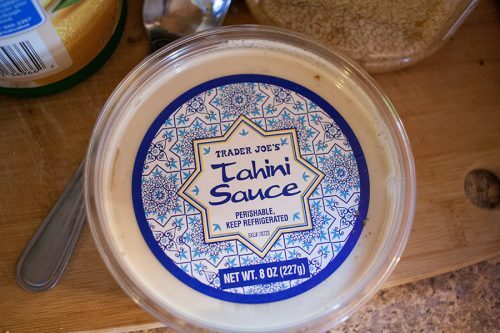 You can get the perishable Trader Joe’s tahini sauce ($2.99 per 8 oz container) or get a larger container at an Asian market. 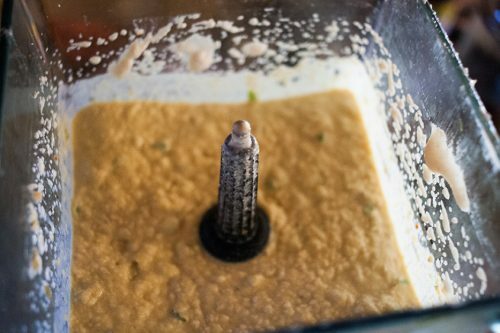 The tahini (sesame seed paste) is added on top of the chickpeas, in the blender.